I have rules for myself when I’m making pictures, which I almost never break. And so, when I was in the Methodist church right before I visited this one, I went to the pulpit and looked around, and checked out the view from the organ. But in a Catholic church? I don’t go past the railing. It’s a Rule. But I have been known to lean back against it to get a particular shot. Like this one right here. The placement of Jesus’s cross in the shot was important to me, so a certain amount of railing-lean was required. 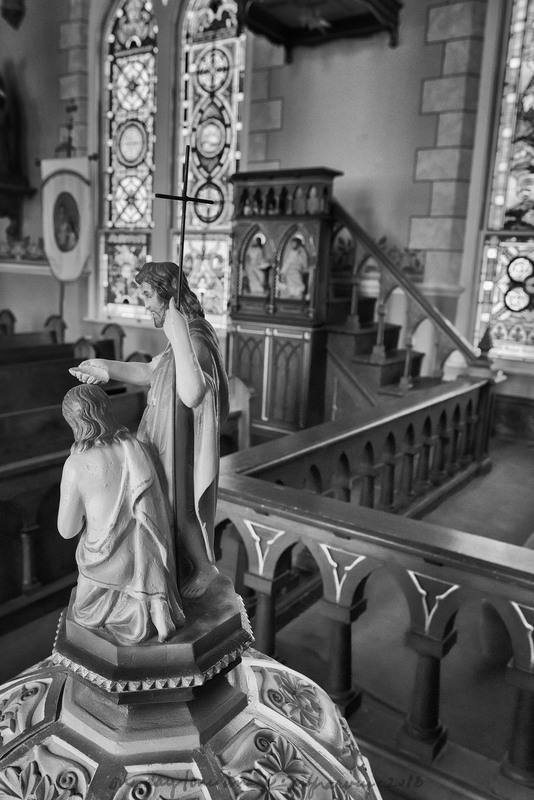 Posted on February 9, 2018, in Photography and tagged 365 photo project, architecture, black and white photography, church, High Hill, High Hill Texas, learning to see, melinda green harvey, monochrome, Nativity of the Blessed Virgin Mary Catholic Church, one day one image, painted churches, photo a day, photography, postaday, road trip, texas, thoughtful seeing, travel photography. Bookmark the permalink. 5 Comments. Capturing the perfect image truly is a gift. One which I do not possess, lol. Thanks for saying I can capture the “perfect image” – although I am not sure I agree! The best I could get under the particular circumstances is what I aim for…. Thanks for looking at the photos, and for commenting! Well I think it’s perfect. You’re quite talented with the camera. I forgive you. Which is not worth much. It might be worth a lot…. !